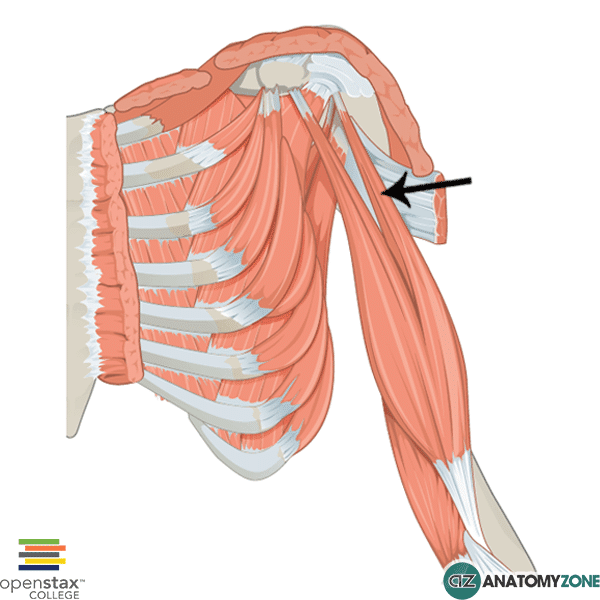 The structure indicated is the long head of the biceps brachii muscle. The long head of the biceps brachii originates on the supraglenoid tubercle of the scapula, and traverses the superior aspect of the glenohumeral joint to descend in the intertubercular sulcus (bicipital groove) of the humerus to enter the arm. The long head of the biceps is the larger of the two muscular heads. Since the long head tendon crosses the glenohumeral joint, the biceps brachii also has action at the glenohumeral joint and is an accessory flexor of the humerus.